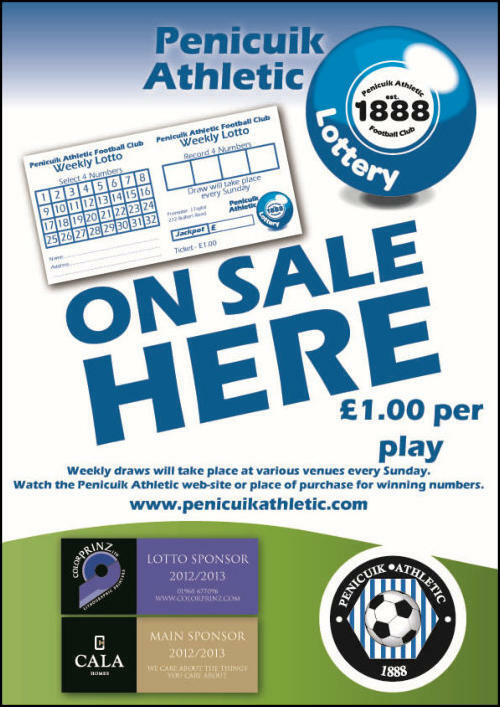 Penicuik Athletic Weekly Lottery Penicuik Athletic are pleased to announce that our own Weekly Lottery Prize draw has started with the first draw for a £200 jackpot being made on Sunday 9.9.12. Each week Lottery tickets will be available at various outlets in Penicuik, from any committee member and on match days. Pick four numbers and you will win the Jackpot. If the Jackpot is not won, then the money will be carried forward each week increasing the jackpot prize . The jackpot prize will be capped at £5000, if that happens, a second jackpot will be set up and increased by £100 each week until the £5000 jackpot is won. If the second jackpot reaches £5000 whilst the first jackpot has not been won, the second jackpot will be capped at £5000 and a third jackpot will commence.The draw will take place every Tuesday. Agents are required to distribute, sell and collect tickets - contact any committee member if you wish to help. Terms and conditions. 1. Minimum jackpot £50 increased by £50 each week until won. 2. In the event of two or more winners, the jackpot will be shared. 3. Money will not be paid unless numbers are clearly marked. 4. Ticket stubs presented after the draw will be deemed void. 5 Claims must be lodged with any member of lotto committee within 7 days of draw date. 6. From 2.8.16 the Draw will take place every Tuesday evening 7. Ticket winners will be posted on our website and venues throughout Penicuik. 8. The decision of the committee is final on all matters relating to the draw. 9. Please see website and posters for further details.